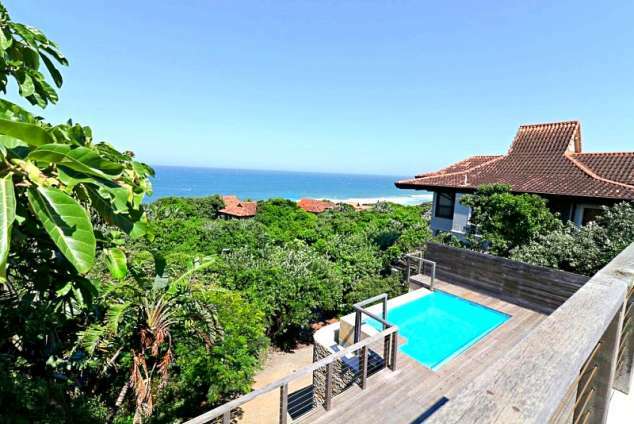 31 Milkwood - Zimbali Accommodation. The modern décor and quality of finishes throughout makes this a holiday home of distinction. This 5 bedroom, 6 bathroom unit is a tranquil getaway from the rigours of everyday life. With inspiration and contents as various as Kiaat clad columns, custom wine cellar and a garden to provide a green oasis for peaceful contemplation, this Milkwood Drive residence epitomizes the luxury of a grand home set in the coastal forest. Set on an elevated site, this luxury home perched above the ocean provides for total seclusion and privacy. The seamless integration of the interior and exterior in the architectural design presents an open feeling that invokes relaxation. 1989 page views since 01 Jun, 2018. Last updated on 01 Jun, 2018.